ISOMA Set Tote Bags: These attractive, sturdy and very useful 11" high x 12-1/2" wide tote bags are ideal for carrying various items "on set" while working or for everyday use. Please inform us of your first, second, and third choice of colors in the event your main preference may be out of stock. ISOMA will select a color for you if one is not submitted. 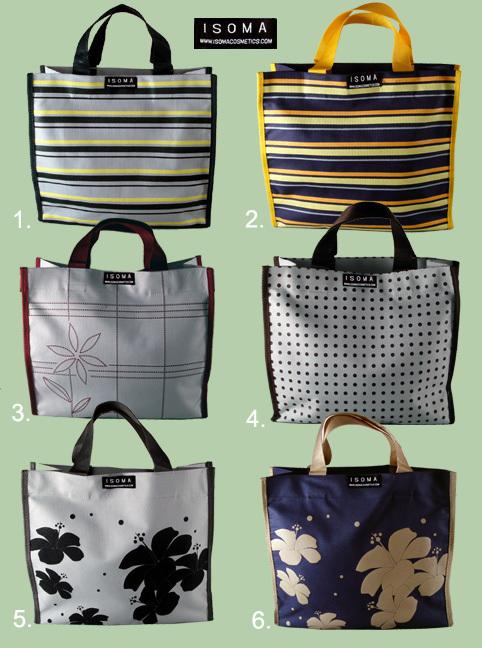 ISOMA Set Tote Bags are $20.00 each. ISOMA Baseball Caps: These smart looking, colorful and trendy caps which proudly display the ISOMA name have an adjustable strap in the back. Please inform us of your first, second, and third choice of colors in the event your main preference color may be out of stock. We will select a color for you if one is not submitted. 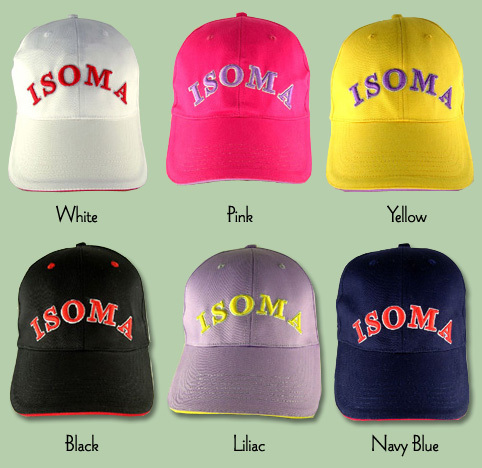 The contemporary designed ISOMA Baseball Caps may be purchased for $20.00 each. ISOMA Black Baseball Cap: ISOMA is pleased to share its official International Society of Makeup Artists classic designed baseball cap with fellow makeup artists around the world. The seven stars under the world represents the seven continents of the world. This is the original classic cap design and color that was created and worn with pride by the original members of ISOMA. The cap features an adjustable strap in the back and the official ISOMA logo in golden embroidered words on a black background in the front. The original classic design ISOMA Black Baseball Cap is $20.00. ISOMA Black Tee Shirt: ISOMA is pleased to share its official International Society of Makeup Artists classic designed tee shirt with fellow makeup artists around the world. The seven stars under the world represents the seven continents of the world. This is the original classic tee shirt design and color that was created and worn with pride by the original members of ISOMA. The tee shirt features the official ISOMA logo in golden words on a black cotton material tee shirt. It is available in a large and extra large size. The original classic design ISOMA Black Tee Shirt is $20.00. 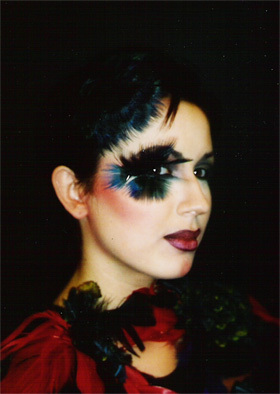 Both of these smart looking and prestigious items are a sign of makeup artistry professionalism and they have been worn with great pride in the industry by many distinguished professionals for many years. ISOMA Sew-on Emblem: ISOMA is pleased to share its official International Society of Makeup Artists sew-on emblem with fellow makeup artists around the world. The seven stars under the world represents the seven continents of the world. The emblem features golden embroidered words on a black background. The ISOMA emblem is a 4" x 4" sew-on type and is made of a firm cloth material that may be placed on ones clothing, makeup brush belt/apron or cloth makeup bag. The ISOMA Sew-on Emblem is $20.00. ISOMA Mesh Cosmetic Bags: These very useful cosmetic bags are ideal for holding extra items such as: sponges, powder puffs, pressed and loose powders, eye shadows, blush colors, eye and lip pencils, face wipes, eye drops, eyelash curler, breath mints, etc. They are available in two convenient sizes for your makeup storage needs, the large size bag is 10-1/2" wide x 7-3/4" high, and the smaller size is 9" wide x 4-3/4" high. These bags feature a zippered top and a see-through mesh design for easy recognition of the items you are seeking. They are also available in three separate colors (blue, red, and black,) for quick identification of the items that you may decide to keep in these separate colored mesh bags. The large size ISOMA Mesh Cosmetic Bag is $20.00 and the smaller size is $15.00. ISOMA Watches: ISOMA is pleased to share its official International Society of Makeup Artists classic designed watches with fellow makeup artists around the world. The seven stars under the world represents the seven continents of the world. This is the original classic watch design that has been worn with pride by ISOMA members for many years. The watches feature the official ISOMA logo in black on a golden background and they are available in a men's and women's style. These timepieces offer the perfect blend of performance and style as well as the classic ISOMA logo. Please select the watch style of your preference. The original classic design ISOMA Watch is $150.00. Purchase ISOMA Cosmetic products (foundations and/or powders,) worth $450.00 or more, and receive a free contemporary design ISOMA Baseball Cap and a small ISOMA Mesh Cosmetic Bag. Purchase ISOMA Cosmetic products (foundations and/or powders,) worth $350.00 or more, and receive a free contemporary design ISOMA Baseball Cap or an ISOMA Tote Bag. Purchase ISOMA Cosmetic products (foundations and/or powders,) worth $250.00 or more, and receive a free large size ISOMA Mesh Cosmetic Bag. Purchase ISOMA Cosmetic products (foundations and/or powders,) worth $150.00 or more, and receive a free small size ISOMA Mesh Cosmetic Bag. Please note: products must be bought at one time to be eligible for these offers, not over a period of time. The above fees can not include the tax as part of the purchase offer.